Our Thunderbird spiral mixers are known for their excellent ability to prepare and produce different doughs like bread, pizza or pasta dough. 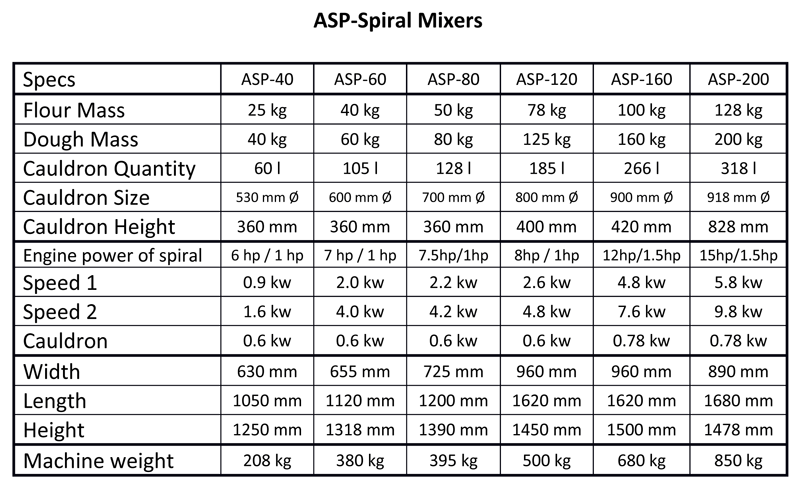 The ASP-Spiral Mixers guarantee an intense and at the same time careful preparation of the dough no matter if it’s rye or wheaten dough. They are equipped with a cauldron and spiral dough hook both made of stainless steel as well as a cutting plate. The mixing tools are easy to clean and even usable for sourdough. When preparing the dough, the cauldron will rotate continuously in one direction. After the rotation process the handler has the option to manually flick a switch to rotate the cauldron in the opposite direction for a short time. The dough hook can rotate in two speeds. Both are linked to a programmable timing device. Next to the spiral dough hook there is a cutting plate which makes a high mixing capacity possible. Not only is the dough divided continuously thanks to this, but it’s also pushed to the mixing tool again and again. That prevents the risk of the dough possibly overheating. These machines don’t just allow the user to comfortably retrieve the dough but also a very easy cleaning of the dough bowl. Among the Thunderbird Spiral Mixers, the ASP-200 dough kneading machine ASP-200 with retractable cauldron and hydraulic systems is particularly elegant. 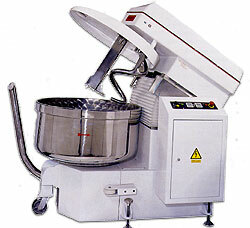 The ASP-200 mixer can be used for dough mass of up to 200 kgs. However even with smaller quantities the high quality of stirring is kept intact. The user can chose between two kneading speeds as well as two directions of rotation (forwards and backwards). Depending on the type of dough the ASP-200 finishes its work within eight minutes. Additionally, a special lift and tilt device (BL-200) can empty the contents of the cauldron fast and comfortably to not delay the preparation of the dough.